Lancet. 2018 Jun 9;391(10137):2335-2345. doi: 10.1016/S0140-6736(18)31082-1. Epub 2018 May 23. Azizi M, Schmieder RE, Mahfoud F, Weber MA, Daemen J, Davies J, Basile J, Kirtane AJ, Wang Y, Lobo MD, Saxena M, Feyz, Rader F, Lurz P, Sayer J, Sapoval M, Levy T, Sanghvi K, Abraham J, Sharp ASP, Fisher NDL, Bloch MJ, Reeve-Stoffer H, Coleman L, Mullin C, Mauri L; RADIANCE-HTN Investigators. The RADIANCE SOLO trial is part of a group of studies looking at the effect of a different (compared to catheter ablation in the SYMPLICITY and SPYRAL system from Medtronic) method of ablation of the sympathetic nerves around the renal artery. This technique uses ultrasound to perform thermo-ablation, and was developed by ReCOR Medical, using what they term the 'Paradise' system. See the video below to see how this works. Like the SPYRAL HTN-OFF system, the RADIANCE HTN SOLO trial was designed to be in patients with mild hypertension, who would be off treatment. Also, like Symplicity-3 and the pair of SPYRAL trials, they were blinded, randomized, controlled trials (RCT) with sham procedures and with ambulatory blood pressure monitoring (ABPM) based outcomes. This was a multicentre trial, involving 39 centres from US and Europe (including UK). If patients were on medications, they were required to stop them for 4 weeks before undergoing the qualifying ABPM study. This needed to be ≥ 135/85 and < 170/105 to be randomized into the study. Unlike SPYRAL, no assessment of adherence (eg drug level from blood/urine) were conducted. All patients remained off antihypertensive medications until 2 months after randomisation unless office blood pressure reached 180/110 mm Hg or home blood pressure reached 170/105 mm Hg before the 2-month evaluation, in which case patients received escape antihypertensive treatment. The primary efficacy outcome was change in 24-hour ABPM between groups at 2 months, compared to baseline, in between groups, as per intention to treat principle. The ABPM were sent to a different blinded centre for analysis - but it is not mentioned if the research personnel measuring office BP and performing the ABPM were blinded to treatment assignment. Patients were provided a home BP monitor and encouraged to measure home BP for 7 consecutive days before every visit. 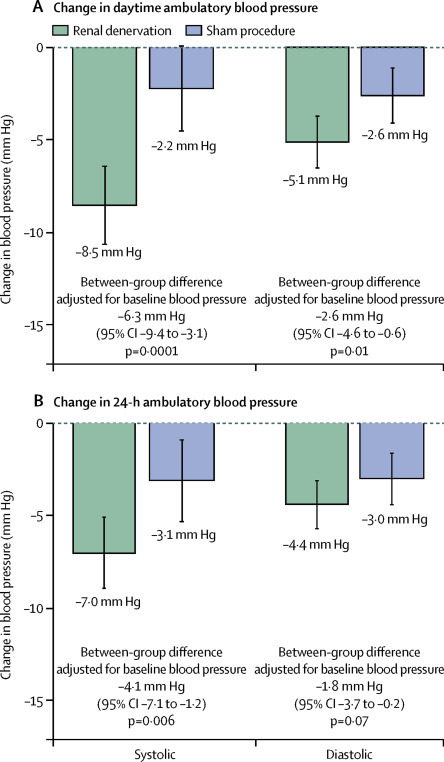 Unlike SPYRAL, there was an a priori sample size estimation: Assuming a 6 mm Hg difference in change in daytime ambulatory systolic blood pressure at 2 months between the renal denervation and the sham groups, a common SD of 12 mm Hg, 1:1 randomisation, and a two-sided type 1 error rate of 5%, a sample size of 128 evaluable patients would yield 80% power. To account for up to 10% missing data on the primary endpoint, they planned to randomise a total 146 patients in the study. The study was funded by ReCor Medical, the device manufacturer. They were responsible for data collection as well as assisted in figure and table generation, copy editing, and formatting. Overall, 803 patients were screened to randomize about 146 patients into the trial. Figure 1 below shows the flow - note that many patients did not fulfil renal anatomy criteria, 109 in first step and 24 in the second, for various reasons (does not make study invalid: only one cannot generalize to those without suitable anatomy). One patient in the intervention group and three patients in the sham procedure reached escape criteria (elevated BP) and required antihypertensive medications. Four and ten patients, respectively, were treated on the basis of the physician's decision or patient preference, despite not meeting protocol-defined criteria. From table 1, the baseline characteristics are similar to the two SPYRAL trials: mean age around 50, and few comorbidities. About 80% were on 1 or 2 medications before washout. At baseline office BP was about 154/100 and 24-hour ABPM was about 150/93. So what happened to blood pressures after intervention? See main results (intention to treat) at 2 months below. The decline in 24-hour ABPM between groups was about 4/2 mm Hg. There was also a decline in BP in the sham group. patients who did not complete the 2-month ambulatory blood pressure assessment. The actual numbers per-protocol were a bit higher than the ITT ( -6/3 vs - 4/2 mm Hg in 24 hour ABPM between groups). As in the SPYRAL trials, individual response varied as shown above in figure 3. There was some exploration of the subgroups shown below. Though interaction p values are not presented, the 95% CI do overlap, so unlikely for any difference in the few compared here. Was blinding effective? It was - presented in the supplementary data (James blinding index ~ 0.7 at discharge and 0.6 at 2 months). Safety: At 2 months, there were no safety signals - and renal artery imaging did not reveal any significant (> 50%) narrowing. Interestingly, one patient in the denervation arm requires a stent at 6 months. An independent review of their preprocedural and 6-month postprocedure renal artery imaging showed that there was a pre-existing ostial renal artery stenosis (40–50% on MR angiography, 44% on renal angiography), which would have met the criteria for exclusion but was not recognised at the time of randomisation, and a 57% ostial renal artery stenosis on renal angiography before renal artery stenting at 6 months. Overall, as with the SPYRAL trials, the RADIANCE SOLO trial shows, that in patients with hypertension, once off antihypertensive medications, that renal denervation with the PARADISE system significantly decreased blood pressure compared to sham controls, with no safety signal at 2 months. Check out our overall summary for comparisons with the other studies and discussion plan.